NXT's penchant for pushing the bulk of its roster and finding ways to incorporate a number of its stars into multiple on-camera storylines at once is laudable. Whereas WWE's main roster has a habit of using the same limited number of talent every week in a monotonous barrage of repeat matches, the black and gold brand, by contrast, uses its once-a-week taping schedule to its advantage by alternating talent week to week, thereby preventing any single wrestler from becoming overexposed. That's not to say some NXT Superstars don't get lost in the shuffle, though. Due to head honcho Triple H signing virtually every notable indie/global wrestler available, the developmental roster has gotten more packed than an inner-city subway at rush hour. This leaves signed talent, who were prominent in other promotions like Ring of Honor not long ago, off TV for months at a time whilst waiting for a spot to become available within the on-screen competition. 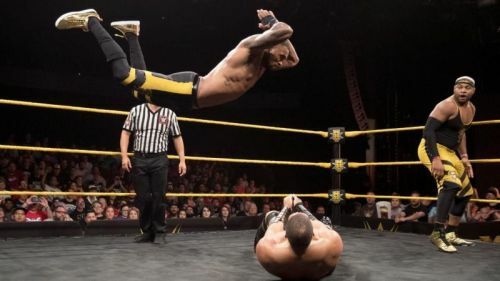 Fortunately, NXT's booking style tends to involve using wrestlers to the best of their abilities, building them up for the hope of future main roster success rather than tearing them down, so in theory, everyone currently signed should have some type of opportunity to eventually shine. This list includes several of those hopefuls, who have all the potential in the world to do equally amazing things as their better-featured peers. These are the 5 top most underutilized stars in NXT. Shane Thorne, formerly of the talented tag team TM61, has recently found himself involuntarily becoming a singles wrestler as his ex-partner Nick Miller (aka Mikey Nicholls) was released from WWE at his own request months ago and returned to Japan, where the two Australian-born wrestlers performed before coming to NXT in Spring 2016. TM61, who were known as The Mighty Don't Kneel outside WWE, never quite got off to a good start, having their name made fun of by NXT fans who double as Pokemon enthusiasts. They lost their first TV match and subsequently came up short in the Dusty Rhodes Tag Team Classic finals to the Authors of Pain, at Takeover: Toronto. A knee injury that took Thorne out of action for a year made things much worse, and a comeback video documentary, heel turn, change in ring gear and name rebranding (as The Mighty) didn't seem to help them get over at all. Perhaps this was the impetus behind Nicholls' departure. Nevertheless, Thorne is an immense in-ring talent, as proven in his excellent singles match against Roderick Strong back in the 2016 Dusty Cup. He absolutely deserves a push in NXT before being inevitably called up to perform for the tepid crowds of 205 Live. Since rumor has it that Thorne is quietly dating Kairi Sane, maybe an NXT love storyline involving the two could be written. On-camera romance with the adorable Sane would certainly endear Thorne to the crowd at Full Sail.